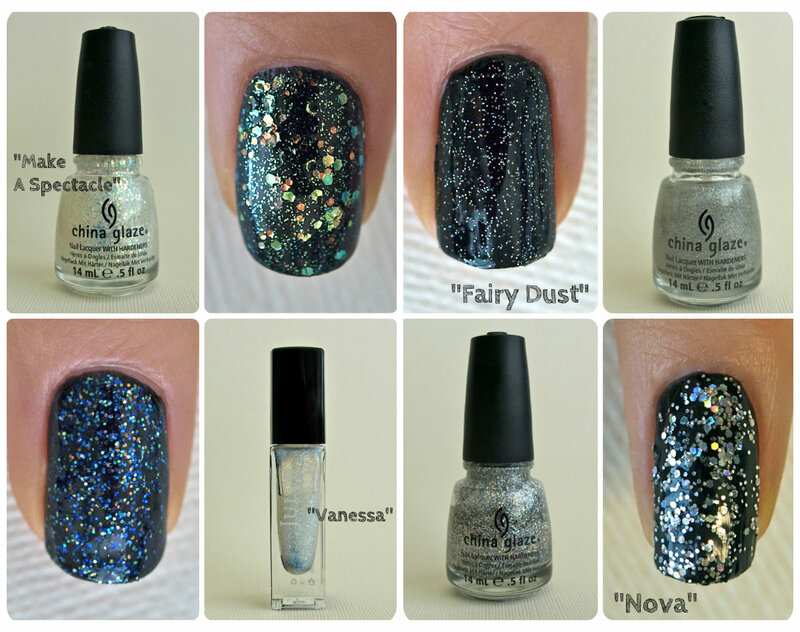 Glitter Polish Swatch and Reviews: "Fairy Dust", "Nova", "Make A Spectacle", & "Vanessa"
Hello everyone, hope y'all are doing well on this beautiful Tuesday. Today I want to share swatches and reviews of a few glitter polishes that I own. I first saw this polish from Vanity Corner, in a galaxy nails post Louise did. The polish consists of fine holographic glitter loosely suspended in a clear base. I have to say I am a tad disappointed with this polish because first of all, it is very gloopy and slow drying. It actually has the tendency of making the base color wet again, thus making dents and smudges way more likely. 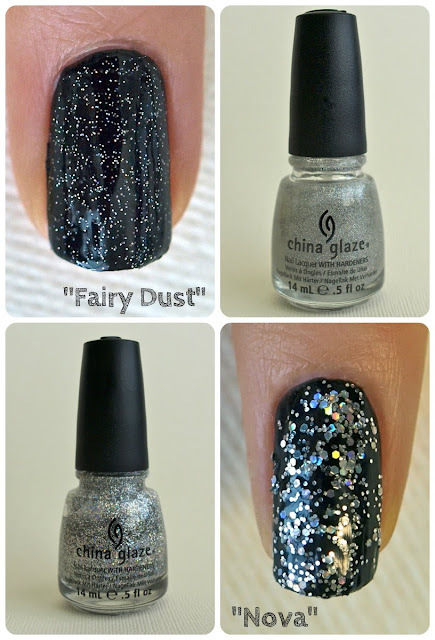 Secondly, the holo pattern is not very obvious, so most of time, they look like plain silver glitter on the nails. So aside from looking awesome on galaxy designs, I haven't found much use for this topcoat. This is a chunkier glitter consisting of large hexagon holographic glitter and smaller hexagon silver glitter. The holo effect is good and the drying time is better than "Fairy Dust" but it applies very unevenly and it looks messy. It just doesn't add much to a manicure. This polish consists of tiny green/yellow flakes, large hexagon green/yellow glitter, and smaller orange/green glitter. The combination looks absolutely fantastic over a dark polish. Over lighter colors, it leans more pink/blue. The application is good and the drying time is much faster than "Fairy Dust"
This polish is absolutely beautiful! Over a dark color, the small hexagon glitter shines blue, green, and yellow. The formula is quite thick but that doesn't affect the application and the drying time is fair. This glitter seems to be very similar to "Portia" from Julep, except that "Portia" comes in a very sheer blue base. Also, just a sidenote, "Vanessa" is always on sale for $7.99, and if you text "julep" to 33733, you get a 50% off code that you can use toward all single colors; so basically, you can get the color for only $4. 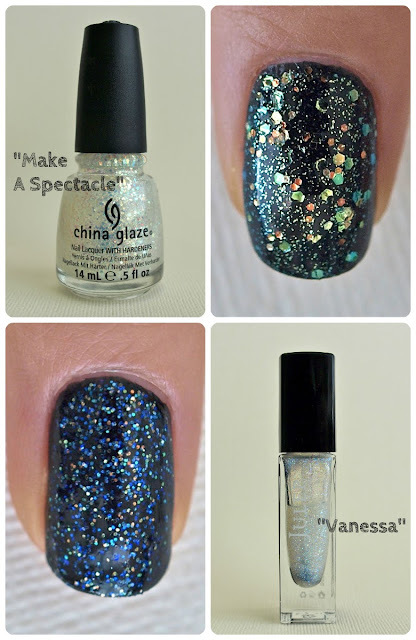 Alright, that is all for today, what are some of your favorite glitter polishes?